It doesn’t matter what political stance you want to take, in a Nation where in one State Court directs to look for alternative to pellets and in another asks, why not shoot when the State is burning after a verdict !! - there’s no way a sane person can say defusing bombs and clearing minefields is a bad thing. It’s good for everybody – not just the for the army soldiers but more so for the citizens of the Nation. Avanti was an ancient Indian janapada (realm), roughly corresponded to the present day Malwa region. The janapada was divided into two parts by the Vindhyas, the northern part had its capital at Ujjayini and the southern part had its centre at Mahishmati. Madhya Pradesh (MP) (Central Province) has its capital as Bhopal and is the "heart of India" due to its geographical location. It borders the states of Uttar Pradesh, Chhattisgarh, Maharashtra, Gujarat and Rajasthan. Shortly before 11 a.m. on March 15, 1945, the first of 36 B-17 Flying Fortresses of the 493rd Bombardment Group of the U.S. Eighth Air Force thundered down the concrete runway of Little Walden airfield in Essex, England, and rose slowly into the air. They headed east, gradually gaining altitude until, assembled in tight box formations at the head of a stream of more than 1,300 heavy bombers, they crossed the Channel coast north of Amsterdam at an altitude of almost five miles. Inside the unpressurized aluminum fuselage of each aircraft, the temperature fell to 40 degrees below zero, the air too thin to breathe. They flew on into Germany, passing Hanover and Magdeburg, the exhaust of each B-17’s four engines condensing into the white contrails every crewman hated for betraying their position to defenders below. But the Luftwaffe was on its knees; no enemy aircraft engaged the bombers of the 493rd. Even now, 70 years later, more than 2,000 tons of unexploded munitions are uncovered on German soil every year. Before any construction project begins in Germany, from the extension of a home to track-laying by the national railroad authority, the ground must be certified as cleared of unexploded ordnance. 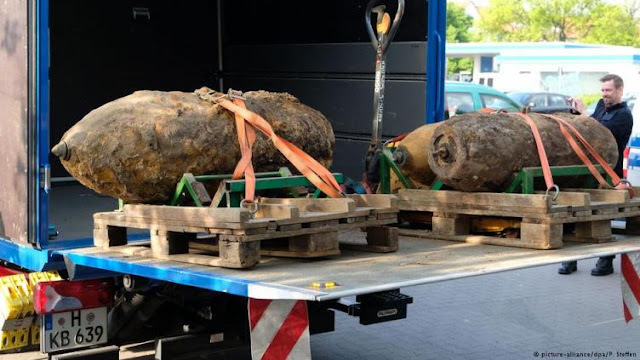 Still, last May, some 20,000 people were cleared from an area of Cologne while authorities removed a one-ton bomb that had been discovered during construction work. The record-breaker preceded the current operation by merely a few months, when on Christmas Day 2016, 54,000 people in the southern German city of Augsburg were similarly evacuated from their homes. Three members of a bomb disposal squad were killed in the north-central German city of Göttingen during an operation to defuse a bomb in 2010. This is no post on World War or on aerial bombing – but the courageous act of a Police cop that has saved hundreds of school children. A police officer in Madhya Pradesh is hailed a hero after he picked up a 22lb bomb found in a school playground and sprinted down the road to protect the 400 children in the area from being injured. Abhishek Patel, 40, grabbed the bomb with his bare hands on Friday and ran away with it to minimise damage to the school in of Chitora, Sagar District, Madhya Pradesh State, Central India. 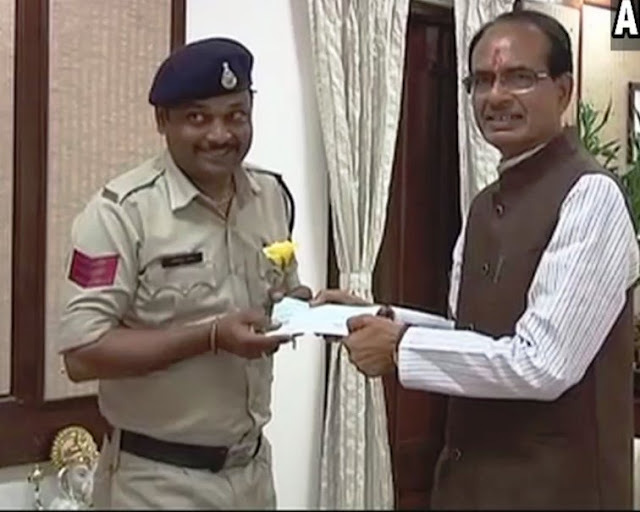 Head constable Abhishek Patel, posted at Surkhi police station in Sagar district, was honoured by Chief Minister Shivraj Singh Chouhan as the video of the cop’s action went viral on the social media. A state public relations department official said the incident had taken place on August 25. An anonymous caller informed the ‘Dial -100’ service of the state police at around 12.50 pm on August 25 that an unexploded artillery shell was lying in the backyard of the Middle School at Chitora village of Sagar district, the official said. After reaching the spot, Patel got the school evacuated, as over 400 students were present there at that time. In the meantime, he picked up the shell, weighing around 10 kilograms, and ran for about a kilometre before dumping it into a nullah, the official added. The army personnel of Mahar Regiment Centre at Sagar finally defused the shell on Sunday. The Madhya Pradesh government on Monday presented a cash reward of Rs.50,000 to Patel here for his brave act. The Govt has recognized the great deed, yet the amount is far less than what a Man of the Match would have fetched in IPL –one cannot stop thinking . R S Bagir, in-charge of Surkhi police station, under whose jurisdiction the school is located, said it is yet to be confirmed from where the shell reached the school. “It is not yet known from where it landed in the school backyard. This was an unexploded and old. It is possible that a villager might have brought it from a nearby army shooting range. We are investigating it,” Bagri said. The most valiant run of 1 km by the Head Constable and acclaims should be heaped on the great man – Abhishek Patel. It certainly was too risky a job and he could easily have sacrificed his life, if something had gone wrong ~ yet, his singular aim was to protect the school children. How noble ! !